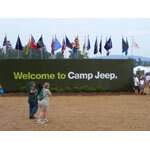 Camp Jeep is an offroading event that was created by Chrysler to connect with Jeep owners and strengthen their brand. Camp Jeep is typically a 3-day event which has Jeep trail rides as well as several other activities such as: mountain biking, climbing walls, hiking, crafts, and musical acts. Jeep also uses these events as an opportunity for their engineers to get candid product feedback from real Jeep owners. Schedules of future Camp Jeep events can be found on the Jeep.com web site.